Whilst equities saw minor weak chop across the day, the VIX was also generally weak (intra low 15.81), but managed a minor rally into the close, settling +1.6% @ 16.66. 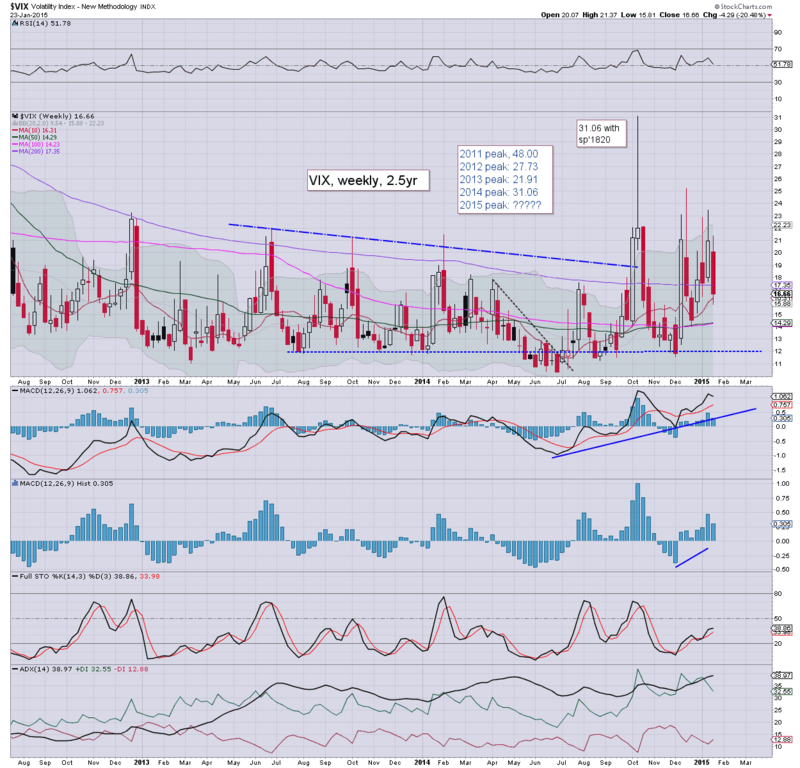 The VIX saw a net weekly decline of a very significant -20.5%. VIX saw a major down swing... and the big 20 threshold has been lost. Underlying MACD (blue bar histogram) cycle on the weekly chart will offer a bearish cross in two weeks time. If that is the case, it will bode for 3-4 weeks of further equity upside...taking us into late February.. with the sp'2100s. US equities settled moderately mixed, sp -11pts @ 2051 (intra high 2062). The two leaders - Trans/R2K, settled lower by -0.1% and -1.8% respectively. Near term outlook is bullish, with a straight up run into sp'2100s. ... and another week comes to a close. A rather important week.. with the ECB deciding it now needs to resort to buying Govt' bonds with money it prints from nowhere. No doubt.. that will end well for all those in the EU. Despite the weakness into the close, all indexes saw net weekly gains... and there looks to be further upside across next week. *the usual bits and pieces across the evening... to wrap up the day. 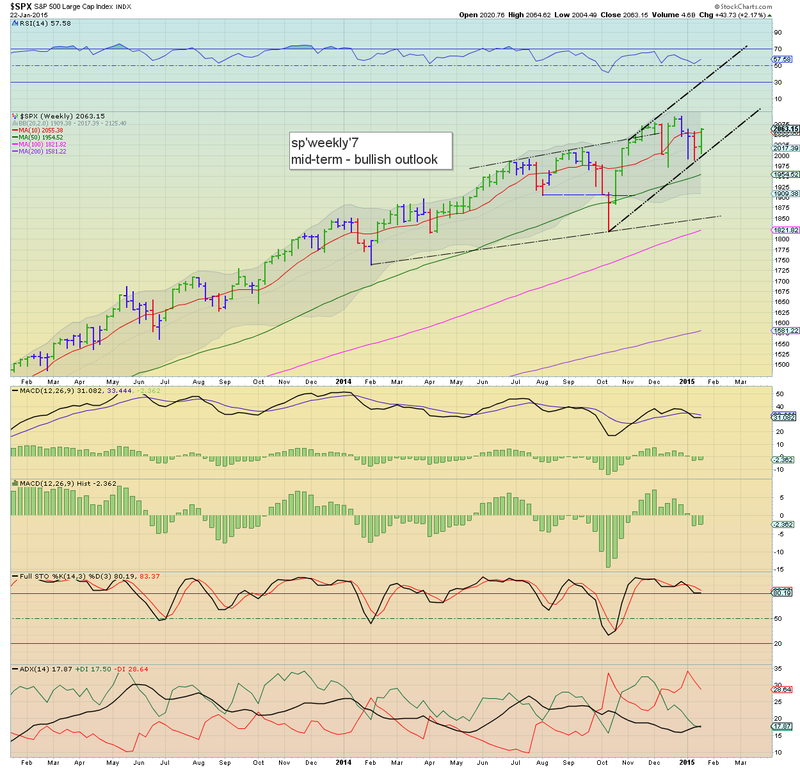 US equities are set for the first net weekly gain of the year, with a gain of almost 2% for the sp'500. Metals are ending the week on a down note, Gold -$12. Energy remains mixed, with Nat' gas +3.1%, whilst Oil -2.0%. Thank the gods... its almost the weekend! Regardless of the exact close, equity bulls have held the market well today, and look set for 2070s next Monday. 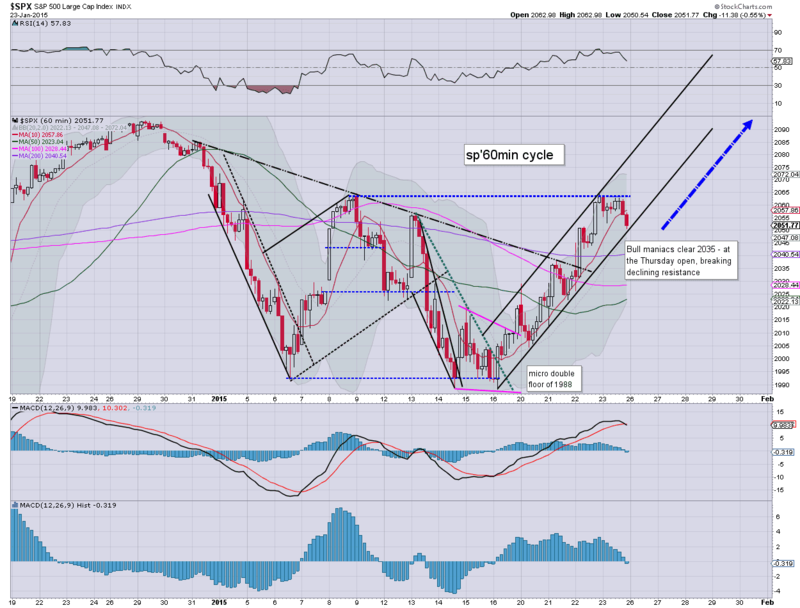 Weekly cycles are offering the 2120s in the near term, although that will likely take at least two weeks. back at the close... unless something 'interesting' happen before then. Equities are clawing slowly higher, battling for a weekly close above the Jan'9 high of sp'2064. In any case, the door looks wide open to a straight run into the low sp'2100s. 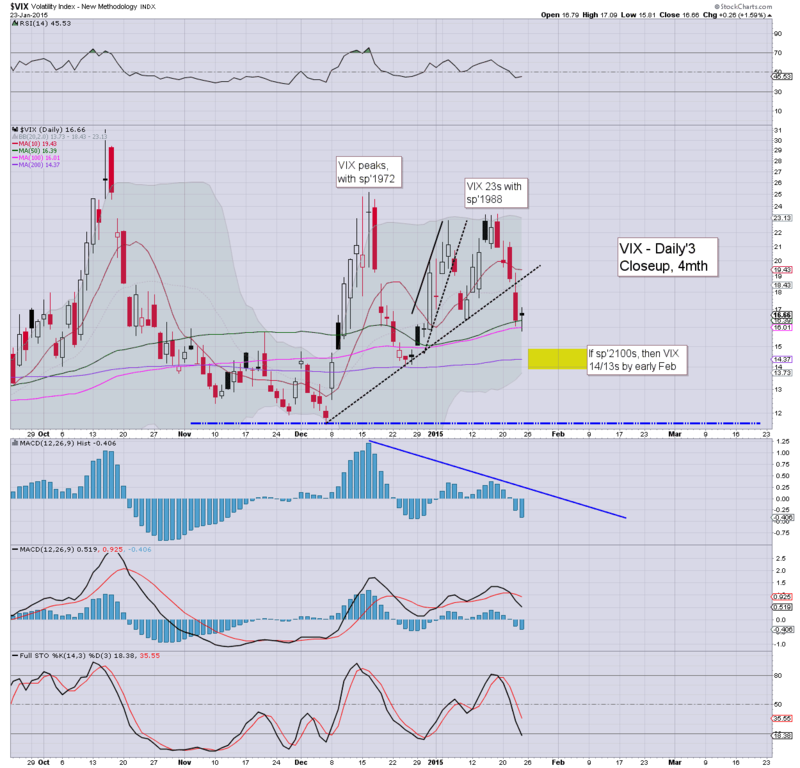 VIX is reflecting a calmer market, -3% in the 15.80s. Gold remains weak, -$10, but still net higher on the week by around 1.5%. 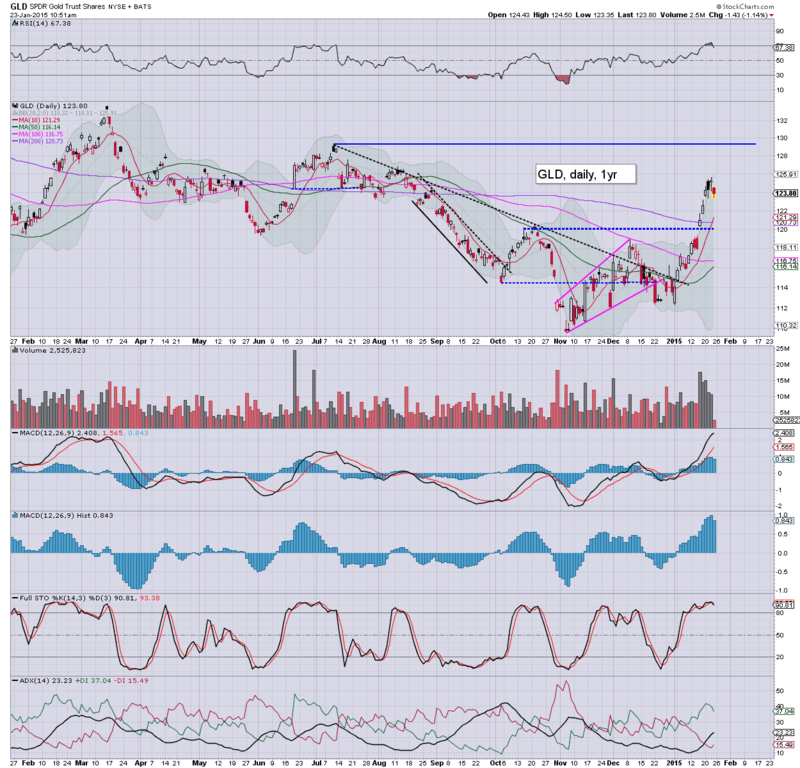 Those still vainly touting the recent move from 1988 to 2062 as a B wave... are set for disappointment into the weekend. I'm also well aware some are seeking a wave down to the 2030s before 2100s.. but even that seems out of range. Bears had their retrace this morning to 2052.. that looks to be it. There really isn't much to add. Underlying pressure - seen better on the daily/weekly cycles, remains to the upside.. and market should be trading in the sp'2100s within a week or two. Certainly, it seems utterly crazy for anyone trying to capture any minor down cycles along the way. 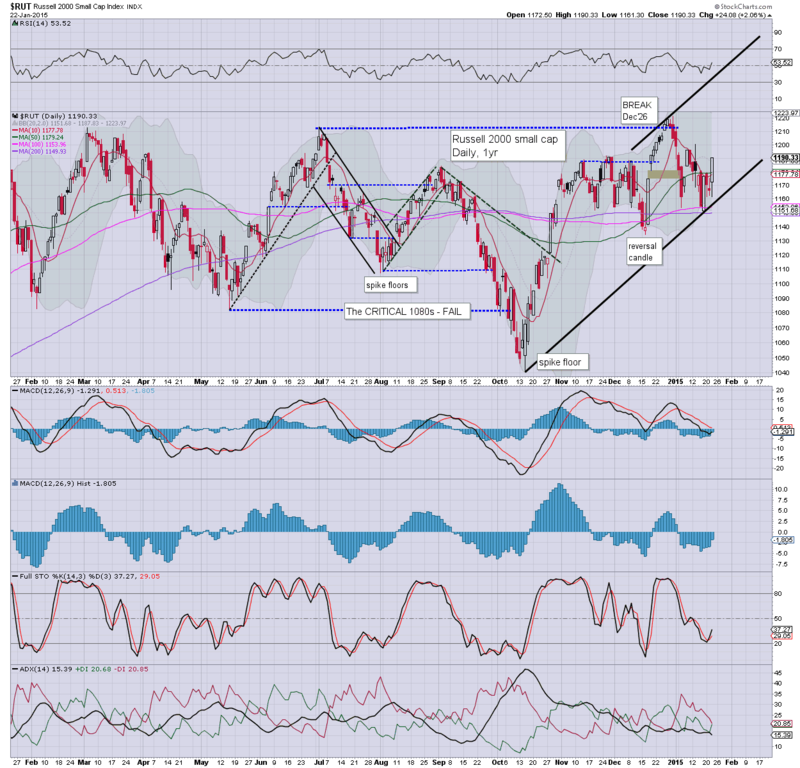 Multiple aspects of support in the sp'2050/45 zone.. I sure don't see a weekly close under there. US equities open with some weak chop... into the mid sp'2050s. 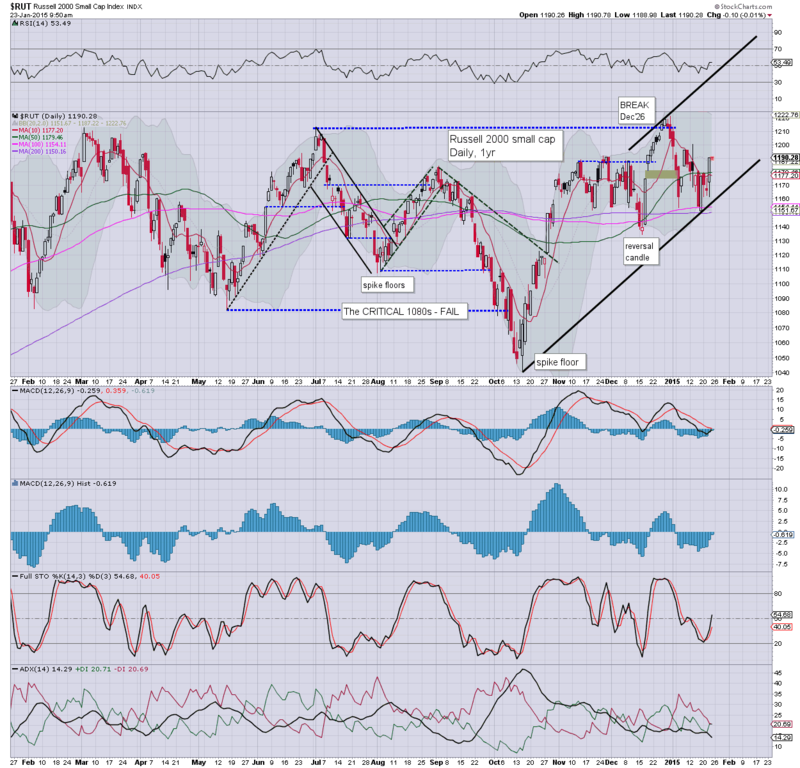 There is strong support in the 2050/45 zone... a weekly close looks likely above that area. 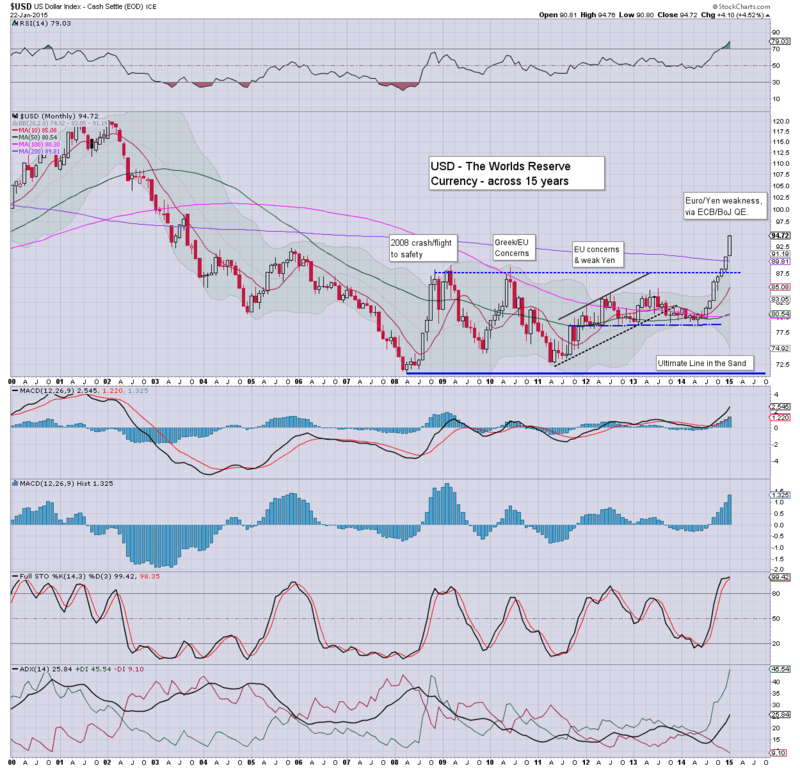 Metals are increasingly weak, Gold -$8. Oil remains weak, -1.2%. King Dollar remains strong, +0.7%, a mere 6% from the giant DXY 100 threshold. 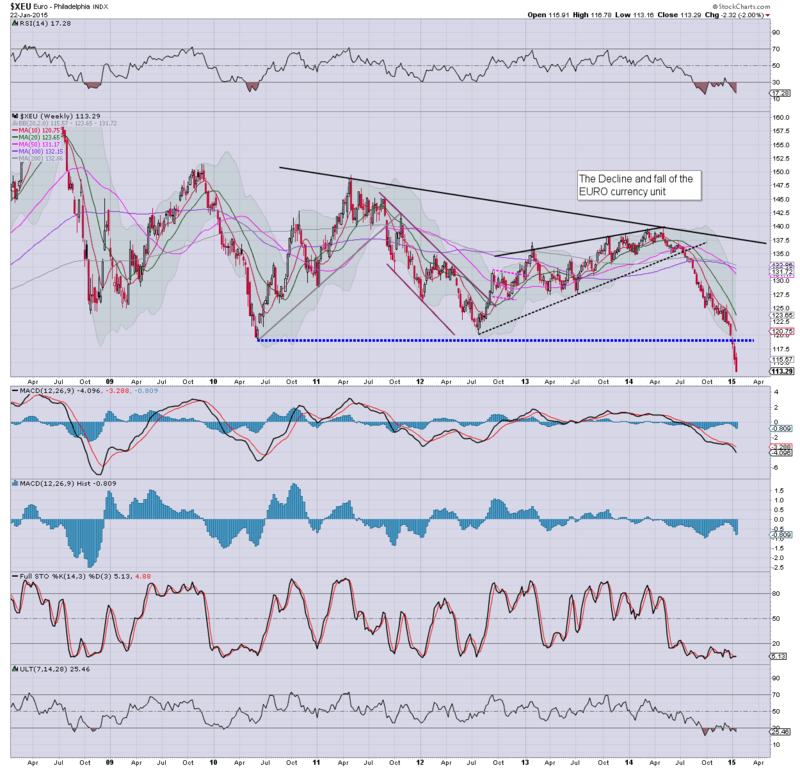 *notable minor strength in the R2K, a weekly close in the low 1200s is viable. Not much to add... on what will mainly be a day of consolidation and reflection after the ECB announcement. Good morning. Futures are a touch lower, sp -3pts, we're set to open at 2060. Metals are lower, Gold -$6, whilst Oil is -.0.7%. Equity bulls should be content with any weekly close above the 50dma of sp'2046. It has been just a 4 day week, but it has felt like six. I realise some are looking for a test of the 50dma in the sp'2040s.. but frankly, we might not even do that. 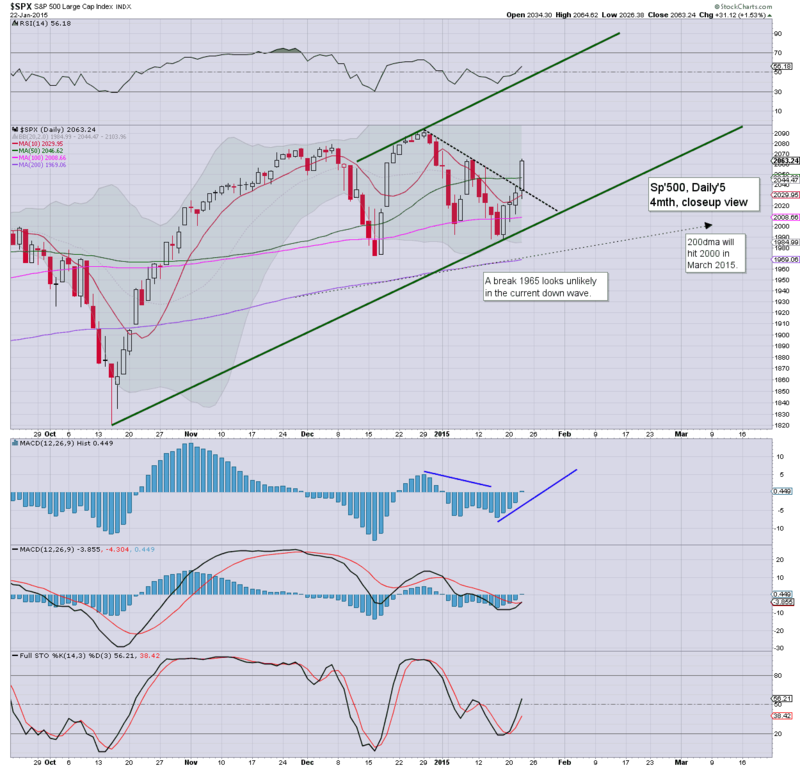 As things are... a weekly close in the 2070s is possible. In either case.. we look headed for the 2100s, which will merely make for yet another higher high. Yet another update from Mr C.
With the ECB announcing what is effectively QE-pomo for the EU equity markets, the USD continued to climb, settling higher by a very significant 164bps (1.8%) @ 94.72. The giant 100 threshold looks a given in the first half of this year. So.. the ECB has finally cracked, and is now planning to start buying Govt. bonds in March, and at least continue until Sept' 2016. The whole program should be seen as equivalent to the US Fed's QE-pomo. Not surprisingly, the Euro continues to implode... parity is coming. Even then... the bigger issue is what happens across the next few years? 2 - an agreement is made for a two tier euro, although that is hard to believe as viable. 3 - complete disintegration of the euro.. with ALL member states going back to their original currency. The third scenario would be a horror story for the European Union, and right now.. it remains a VERY valid outcome, considering the underlying structural problems.. few of which are being addressed. The first green candle of the year... and a weekly close in the sp'2070s is now viable.. as the daily charts would suggest. First key target are the sp'2120/30s by mid February. Friday will see a trio of data - PMI manu', existing home sales, leading indicators. If those all come in 'reasonable' that will be enough to kick the market into the sp'2070s.. a mere 1% from breaking a new historic high. After an early morning washout, US equities built significant gains across the day, with the sp'500 settling +31pts @ 2063. The two leaders - Trans/R2K, settled higher by a very significant 2.9% and 2.1% respectively. Near term outlook is for a straight run to the sp'2100s. The 50dma has been cleared on most indexes.... bulls have a clear break to the upside... with a fourth consecutive daily gain. 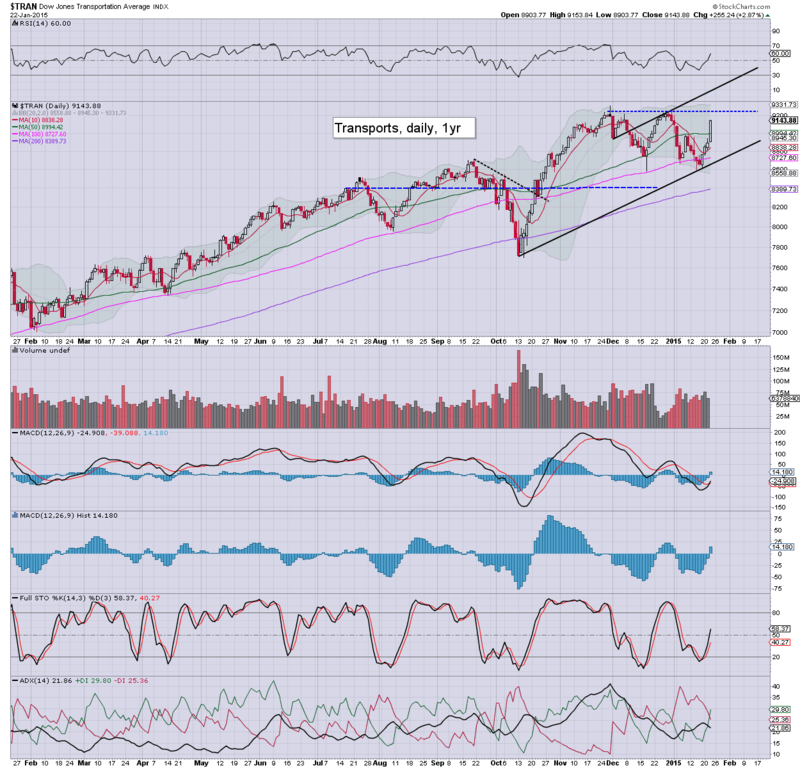 We're headed for the sp'2100s...and new historic highs on most indexes.